Savory Bacon Cheddar Waffles are a homemade cornmeal waffle recipe with bacon and cheddar mixed in! Top with eggs and veggies for a complete breakfast. At least once every week, my family enjoys breakfast for dinner. 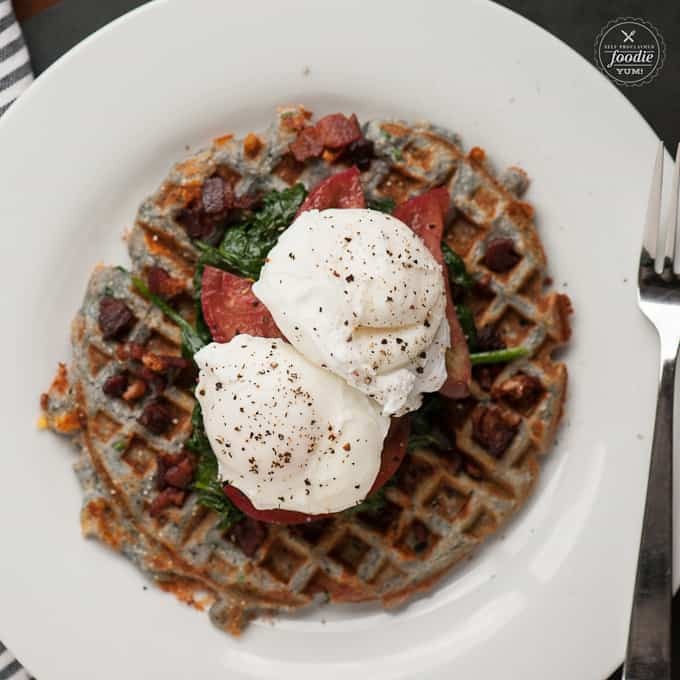 These homemade Savory Bacon Cheddar Waffles with poached eggs are a new family favorite! Does your family enjoy breakfast for dinner as often as we do? I just assumed that’s how every family operated, but once I started asking around I found out that not as many people eat breakfast for dinner. At least not at the rate we do. What’s not to love about eating breakfast for dinner? In my opinion, the only restriction is that it has to be a savory meal. Having something sweet that’s covered in maple syrup just doesn’t work in the evening. I don’t know why. 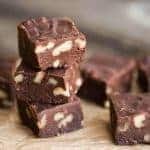 I think it has to do with the fact that a sweet breakfast goes hand and hand with a hot cup of coffee, and if I drink coffee any time after 1pm, I toss and turn all night. A savory breakfast for dinner is the way to go. To me, this almost always entails eggs with some kind of carbohydrate like potatoes or these waffles. This was the first time that I made this particular variety of waffles. Admittedly, the waffles consumed in my house are almost always smothered in fresh fruit, maple syrup, and occasionally whipped cream. 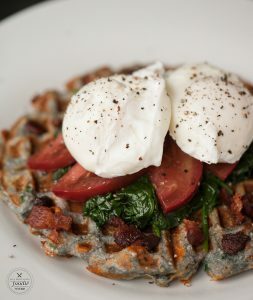 How do you make a savory homemade waffle? 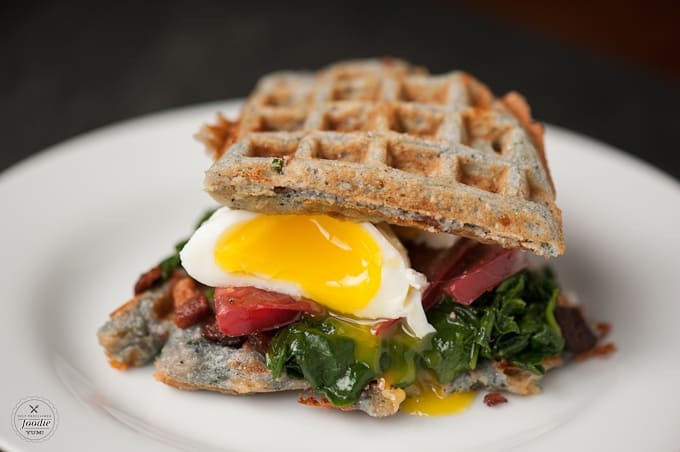 To make a savory waffle, just add in whatever ingredients you’d add to a delicious waffle. 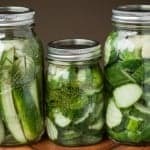 Think about things like spinach and artichoke, sun dried tomato and feta, or my personal preference for the evening – crispy bacon, sharp cheddar, and chives from the garden. I also love the addition of cornmeal. 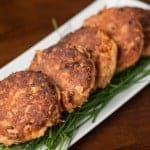 It adds a gritty texture which makes it extra hearty. 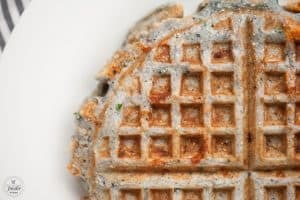 The fact that I only had blue cornmeal as opposed to your standard cornmeal really through my kids for a loop because they thought the waffles looked like blueberry waffles! 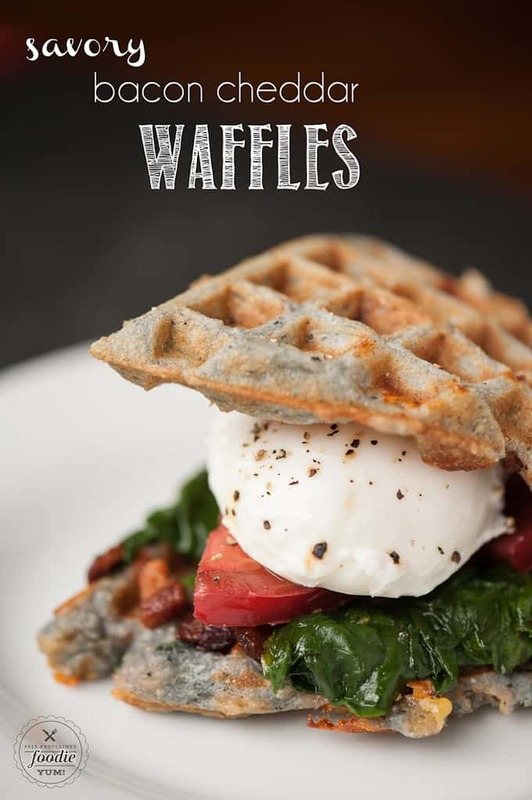 What do you serve with savory waffles? 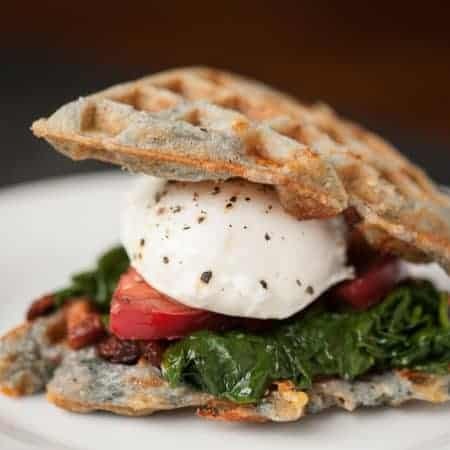 You can top these waffles with anything you’d like, but for this particular dinner I went with sauteed spinach, heirloom tomato, and poached eggs. I served all of this on top of the waffle and went with the fork and knife option. That is, until I saw my kids break their waffle into sections and make a sandwich out of it. Pure genius! Love homemade pancake and waffle recipes? 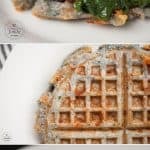 Savory Bacon Cheddar Waffles are a homemade cornmeal waffle recipe with bacon and cheddar mixed in! Top with eggs and veggies for a complete breakfast. 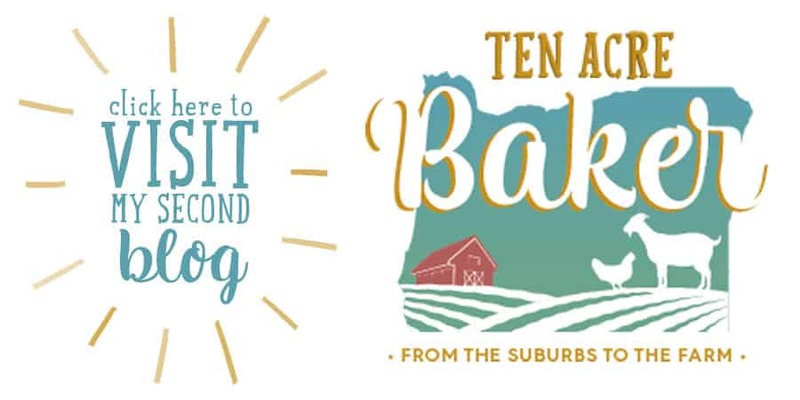 Place flour, cornmeal, sugar, baking powder, baking soda and salt in a large mixing bowl and stir to combine. Add shredded cheddar, chopped chives and cooked bacon pieces. Stir to coat. In a separate bowl, mix the milk and melted butter. 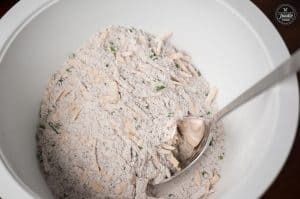 Combine with the dry ingredients but do not over mix. 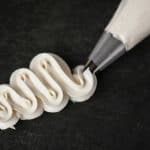 Whisk the egg whites until soft peaks form. Gently fold them into the batter, doing your best not to deflate them. Let batter rest 5 minutes before using. Preheat your waffle iron to medium according to the instructions. Pour enough batter into the center of the lower grid so that it covers about half the surface area. Allow the batter to spread toward edges for 5 seconds, then close the lid of the waffle iron. Cook until the green indicator light turns on again. Remove the waffle and repeat with the remaining batter. For best results, serve immediately. You may keep waffles warm until ready to serve in a 200°F oven. 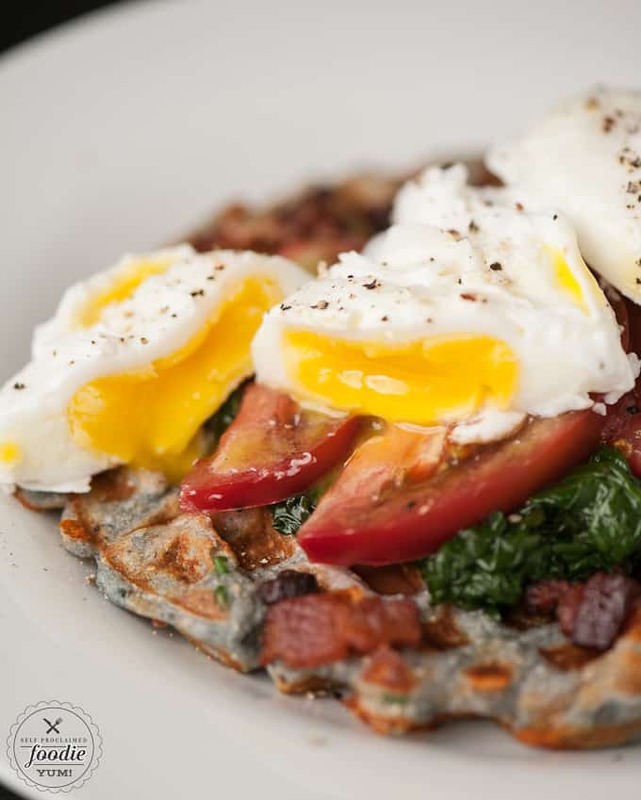 Serve with wilted spinach, fresh tomato, poached eggs and hot sauce. Nutritional info based on waffles only, not eggs and veggies I put on top. As a single mom myself, I couldn’t agree more – breakfast has to be super speedy and simple – and heck yeah to a decadent dress up blueberry sauce!